Yesterday we sold Anna's stroller. Seems not that long ago we were researching, test-driving, and second-guessing ourselves about just what stroller would be the perfect choice. 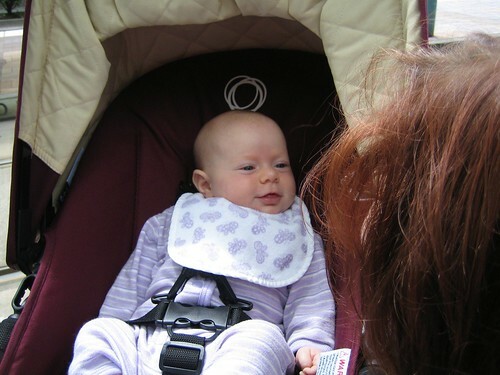 We took a chance on the very expensive Bugaboo, knowing that we could probably sell it in the future. I had read lots of stroller reviews with people saying they ended up with several different strollers for different purposes. Seemed to me that by the time you pay for all those different strollers, you could have just gotten one that did it all in the first place. In any case, we loved our Bugaboo. It truly did meet all of our needs for far longer than we expected. But on our recent trip to Japan we didn't bring a stroller, and we did a lot of walking. A lot. And you know what? Anna kept up. She who usually whines about a quick walk to the park walked for hours each day as we toured Tokyo and Kyoto. In our travels to both France and Japan we noticed that children as old as four are never in strollers. So we made the choice that, after Japan, we were done. And today, thanks to Craigslist, the stroller has moved on to a new family. And both they and we ended up paying about half the price of a new Bugaboo. Note to Anna: if you've decided reading Mommy's blog might be a good second choice, please stop and go to bed!